Toshiba has begun shipping a new model in its lineup of combo projectors: the TLP-XC2000U, which combines an XGA LCD projector with an integrated, fold-out document camera. The TLP-XC2000U, seen below with the document camera retracted and expanded, offers a resolution of 1,024 x 768, a brightness of 2,000 ANSI lumens, and a contrast ratio of 400:1. 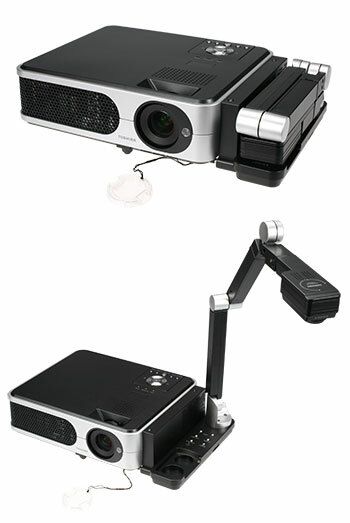 Its retractable document camera offers a resolution of 3 megapixels with a manual focus. Its position can be adjusted to zoom in on specific areas of documents. Dimensions: 14.6" x 9.8" x 3.6"
The TLP-XC2000U is available now for $1,099.